Push messaging uses Apple's and Google's servers to manage the delivery of messages to a user's mobile devices. Just like SMS text alerts, push messages can be targeted to specific user groups and geographic groups. Push messages can drive the app to perform additional tasks which makes them ideal for performing read receipts, opening additional content and having the mobile app perform a specified action on behalf of the user. Push messages can contain structured content unlike text messages. They can also play unique sounds and alert the user when they are using the app or when the device is on stand by. Push messages do not incur a cost from Apple, Google or the user's mobile service provider. SMS text messages may incur an additional cost depending on the user's data plan with their mobile service provider. 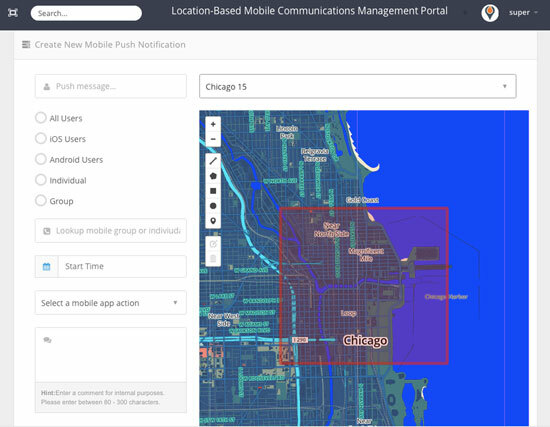 Push messaging uses Apple's and Google's servers to manage the delivery of messages to a user's mobile devices. Push messages do not incur a cost from Apple, Google or the user's mobile service provider. SMS text messages may incur an additional cost depending on the user's data plan with their mobile service provider. Push messages can contain structured content unlike text messages. They can also play unique sounds and alert the user when they are using the app or when the device is on stand by. Push messages can drive the app to perform additional tasks which makes them ideal for performing read receipts, opening additional content and having the mobile app perform a specified action on behalf of the user.